Learning should be life changing. That’s why Friends University offers study abroad and travel courses as well as excellent travel abroad opportunities. Friends University currently offers two degree programs that have service/study/travel abroad options as requirements. In the graduate school, students in the Global MBA program will be travelling to Canada during the summer of 2018 and in the traditional undergraduate college, students pursuing the Bachelor of Arts in Spanish will study in Varadero, Cuba and will participate in various service projects in the area. Undergraduate credit may be awarded for Intermediate Spanish Conversation II, for a Cuba culture and World Culture courses. In the summer of 2018, Friends University full-time faculty will lead World Culture trips to Scotland, London and Germany. Our Fine Arts students also perform all around the world. The Jazz Ensemble has performed at the International Jazz Festival in Havana, Cuba; the Singing Quakers in Europe and Costa Rica; and our opera students in Germany. With our affiliate membership in the Council for Christian Colleges and Universities (CCCU), Friends students can study both internationally and domestically with the BestSemester program. Interested in studying in Ecuador? In Costa Rica? Explore your study abroad options at www.bestsemester.com. Through CISabroad, you can study abroad over a semester, intern abroad, volunteer abroad, participate in faculty-led programs, and/or participate in a non-credit-bearing international trip. You can learn more by visiting the CISabroad.com. 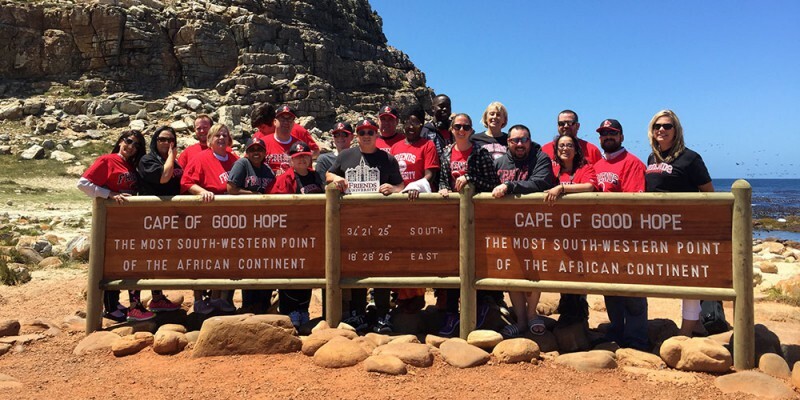 You can also read about some of our student trips on the Friends University blogs. In addition, feel free to browse the study abroad FAQs. 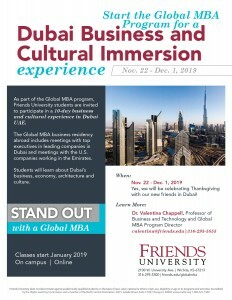 As part of the Global MBA program, Friends University students are invited to participate in a 10-day business and cultural experience in Dubai UAE. 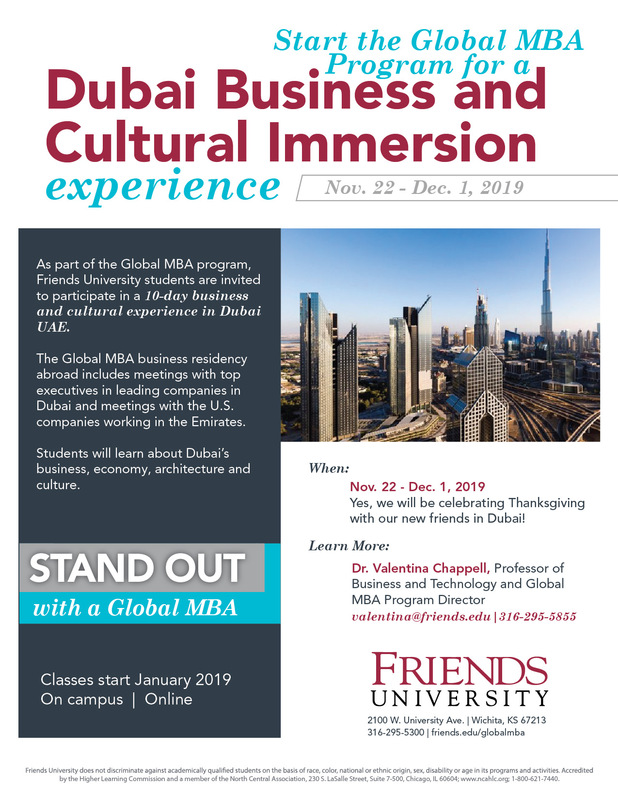 The Global MBA business residency abroad includes meetings with top executives in leading companies in Dubai and meetings with the U.S. companies working in the Emirates. Students will learn about Dubai’s business, economy, architecture and culture. Students in our Health Science program will travel to England to engage in immersive medical and cultural experiences. Students will spend time in clinical rotations at Royal Stoke University Hospital shadowing doctors and learning about the local healthcare system. They will also spend two days in Iceland, visiting natural landmarks and experiencing the Scandinavian culture. Through our graduate workshop program, students have the opportunity to live in London for a week or more, experiencing the cultural and historical wealth of the city. The accommodation in London is in flats in Bloomsbury giving the added benefit of having a home away from home. The goal of the workshop is to experience and interpret ideas from different cultures and different times drawn from art, architecture, literature, philosophy, drama, music and theatre, and ultimately enhance our appreciation of our own and other cultures. In 2018, there is the option to extend the travel to Edinburgh after London. There is a companion course through the Graduate School for MBA and MHCL students to travel at the same time with the group led by Dr. Gibson, stay in the same accommodations but have the additional opportunity to visit British businesses and health care facilities. This unique curricular experience included two weeks of study at Kwame Nkrumah University of Science & Technology (KNUST) in Ghana. It provided exposure to neglected tropical diseases, different health care systems and rural medicine. Aspiring health care practitioners gained field experience valued by medical schools. Mornings were spent in a clinical setting, shadowing doctors. Afternoons were spent in a research center, participating in various research projects. All housing and transportation during the visit were provided by KNUST. In addition, several sites were visited to complete the cultural experience. These sites included: Elmina Castle – a major site in the African slave trade route; Manhyia Palace Museum – built by the British it initially served as the residence of the Ashanti region king; Lake Bosumtwi – considered a sacred lake by the local Ashanti people and located within an ancient impact crater; and a village visit – to see medical needs first-hand. 10 students in our Health Science program spent two weeks in Ghana in immersive medical and cultural experiences. Students spent their mornings in clinical rotations at Kwame Nkruma University of Science & Technology (KNUST) Hospital shadowing doctors and learning about the local healthcare system. Their afternoons were spent in the Kumasi Center for Collaborative Research KCCR) learning various research techniques including the diagnoses of sickle cell, malarial and buruli ulcers. Students spent a day in Brussels, Belgium, visiting historic landmarks and experiencing the continental European culture. Click on each to view photos from each Business Residency Abroad trip. Students will study the Spanish language, Mexican history and Mayan culture at La Salle University in Cancún while living with a host family. In addition, students will teach English at the Wichita-Cancun Sister Cities Elementary School. Students will visit Chichen Itza, Ek Balam, Uxmal, Cenote Ik Kil, Tulum, El Rey, San Miguelito, and El Meco. The Scotland study abroad class will be three and a half weeks long and will be based in Edinburgh, Scotland. Students will study human service agencies, will volunteer and explore Scotland history and culture. Residency will be at the University of Edinburgh with day trips taken to surrounding areas.